This article is brought to you by our friends at Electrolux as part of an ongoing series focusing on seasonal ingredients. This month we're talking salt. 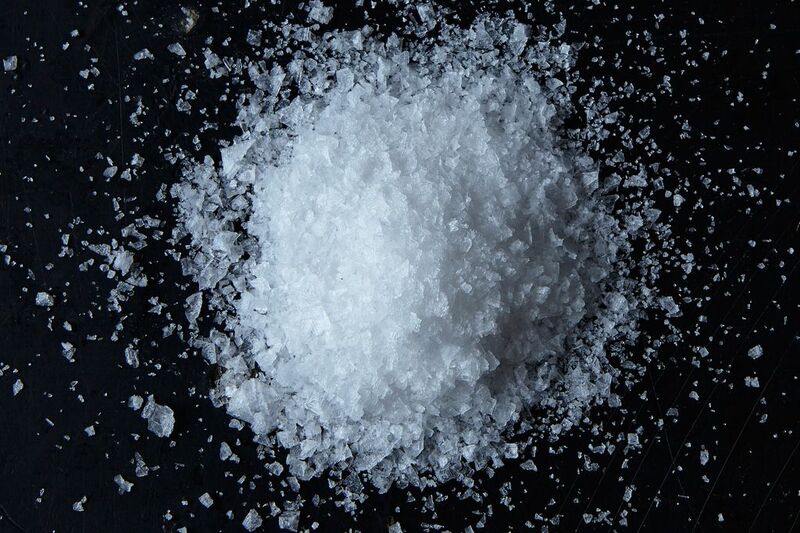 Today: A primer on one of our favorite chemical compounds: good old NaCl. As ubiquitous as salt is in our kitchens and diets, when you start examining it closely, things can start to get a little unclear. What exactly is kosher salt? And when should you use it? Is that familiar container of Morton's ever okay to use, or should you chuck it in favor of something fancier? Is sea salt really worth the hefty price tag? First, let’s step back a bit. All the way to high school chemistry. 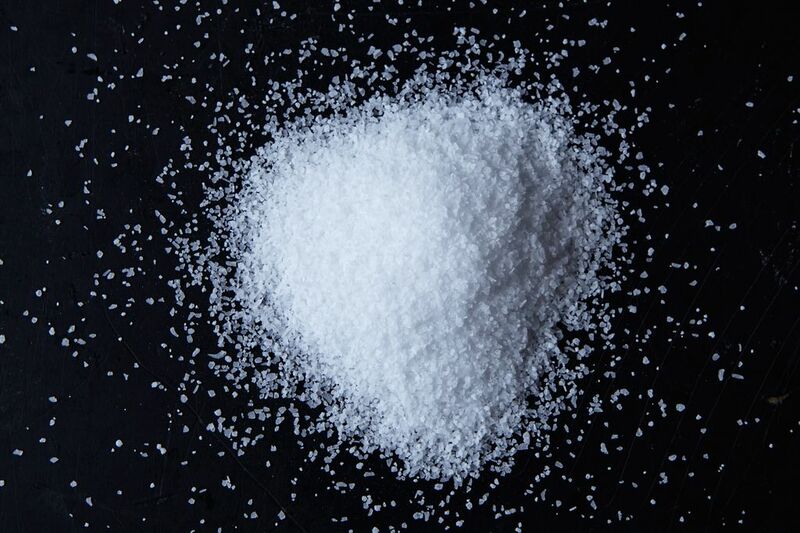 Salt is made of two elements: sodium (Na) and chlorine (Cl). Together, they become sodium chloride -- the salt you know and love. We need sodium to survive, so our bodies are hard-wired to crave salt. 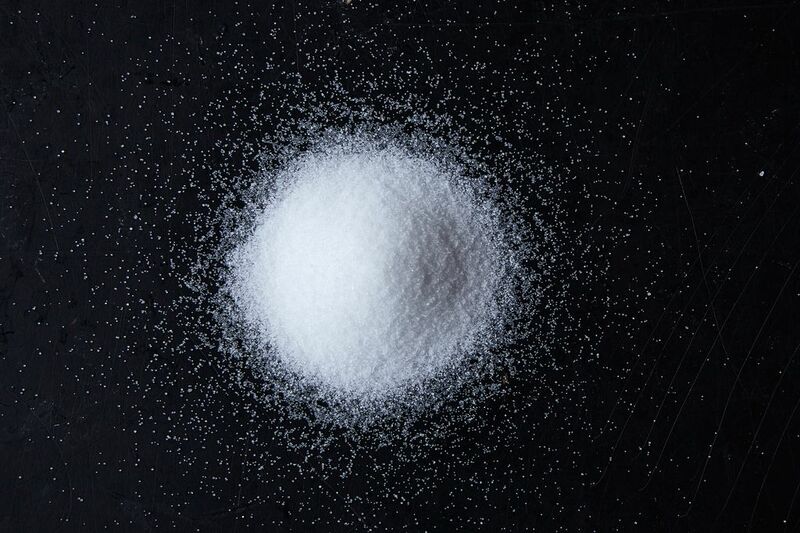 NaCl also works as the ultimate team player, enhancing all of the other flavors in every dish. Suffice it to say, a life without salt would be a difficult life, indeed -- and most certainly a blander one. This is what’s hanging out in your average salt shaker. Mined from salt mines, table salt has anti-clumping agents added. You’ll typically find iodine in table salt, as well -- this is true ever since the government asked Morton’s to add it to their product in the 1920s to help prevent goiter. Take the fact that table salt is industrially produced to have very small crystals, add in those anti-caking agents, and you’ve got a salt that is very dense. This will become important later, when we discuss measuring. Though it may be a little humdrum, there is absolutely no reason why you shouldn't cook with table salt. Long live that little girl and her umbrella! More: Is your dish just a little too salty? Here's how to save it. Like table salt, kosher salt is also extracted from salt mines. However, unlike table salt, it’s additive-free, and is raked to form irregular flakes, as opposed to compact crystals. Kosher salt got its name from koshering, since its larger grains made it very effective at koshering meat (removing blood from meat to adhere to Jewish dietary restrictions). Those larger grains stack much less evenly than the compact crystals, which means that kosher salt is less dense than table salt. Once again, this will be important when we discuss salt substitutions. Unlike kosher and table salt, sea salt is evaporated organically from, well, the sea. It’s often harvested by man instead of machine, and is more costly to produce than its salty cousins. This means that sea salt retains its natural minerals, which can affect its taste and color. 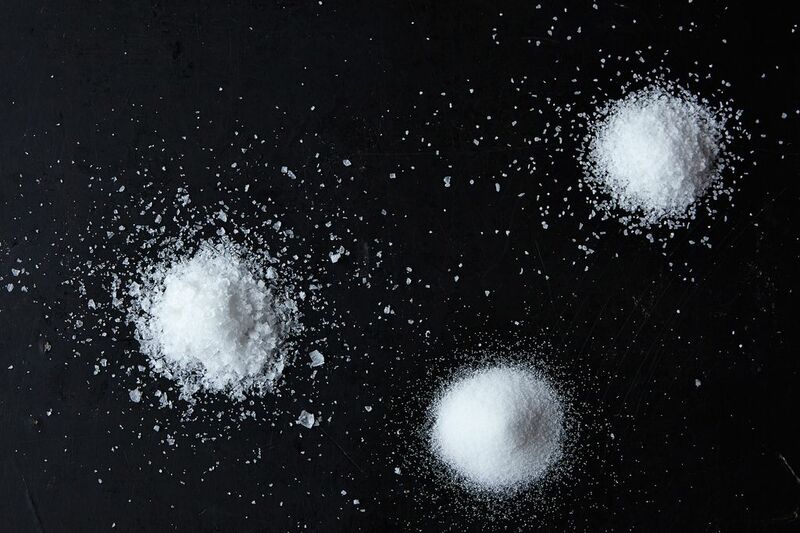 Sea salt comes in three main forms: crystalline, flaked, and fleur de sel. A little goes a long way, so it's often used to sprinkle on top of a finished dish. A few other types of salt we didn’t cover here, but you might be familiar with, are rock salt and pickling salt. Neither is for eating directly on food -- rock salt is typically used for ice cream (remember rolling the coffee can back and forth in your kindergarten class? ), and pickling salt is self-explanatory. These varietals have very specialized uses, so don’t bother investing in them unless you’re planning on making pickles and/or ice cream any time soon! More: But if you do feel like eating salty ice cream, we've got just the recipe for you. As mentioned above, you cannot use different types of salt interchangeably in a recipe that measures by volume. Because of their differing densities, subbing in one salt for another could result in a vastly over- (or under-) seasoned dish. Since table salt is so much denser than kosher salt, you should always use twice as much kosher salt as table salt, by volume. However, if the recipe specifies that you should be using kosher salt, there's no need to adjust the measurement! So why do so many recipes specify that you should use kosher salt? For one, the iodine in table salt can occasionally impart a funky taste to your dish, especially if you’re sensitive to it. Also, as Kenji mentions, kosher salt’s more substantial grains make it easier to handle manually; this means that it's also easier to assess and estimate your seasoning accurately. If the salt is going to be dissolved into the final dish -- as in a sauce -- it absolutely doesn’t matter if you use kosher salt. In fact, table salt actually dissolves more quickly since it has such small grains. Sea salt is the most expensive, and most nuanced, of the salts, so it’s typically used exclusively for finishing dishes. It’s craggy, irregular flakes also make it more difficult to measure for recipes. This article was brought to you by Electrolux, who's all about great taste and the appliances to help you make beautiful meals in your own kitchen. Learn more here. I just bought some Indian black salt; smells vaguely sulphuric. A whole new spectrum of possibilities! All the recipes I've bookmarked, using black salt, are from India. I think it would work well in many vegan dishes, when you're looking for something vaguely eggy, without using, well, eggs. I'm trying it in hummus, right now! Thank you for finally clearing up what kosher salt is - I've lived in the US for nearly 2 years and have never had a good explanation as this is not something you would ever see in a recipe or grocery store back in the UK! I think we might call it rock salt but we're much more likely to use sea salt (Maldon being the favourite brand) in preference. Sea salt in both a coarse and fine grind is usually available in Oriental grocery stores. (Sourced from Korea, I believe) these are sold in bulk and not expensive. ~3.00 - 4.00 $ for 2 lbs. So many baking recipes do not specify what type of salt to use. If it’s an older recipe, I assume it is table salt. (I don’t remember seeing kosher salt in a recipe 20-30 years ago.) If it’s a newer recipe, I’m not sure which to use. Any suggestions? Thanks! I typically use table salt for baking recipes. The large granules in kosher salt, if not dissolved first, can lead to salty pockets, which is not always so delicious. Good old Morton's works fine for me! What should have been discussed here is the whole volume verses weight issue. 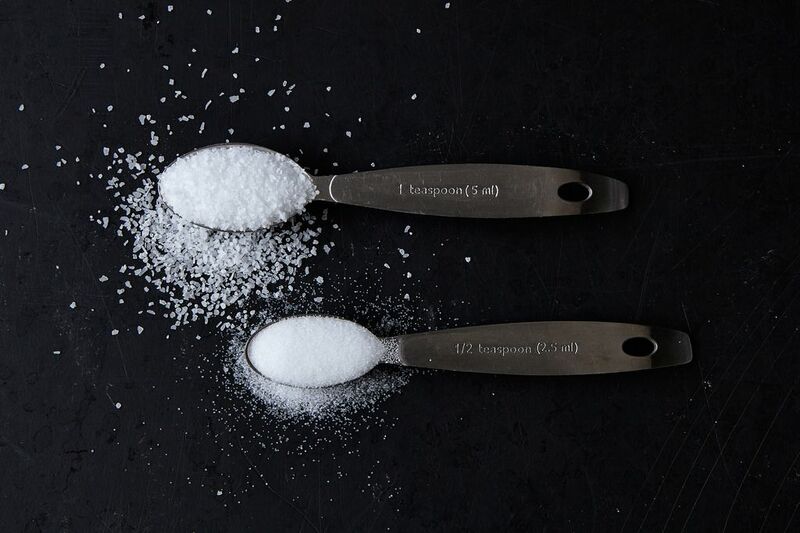 Even within different kosher salt brands, a teaspoon is not a teaspoon. We all need to move into describing the brand of salt used as well as giving weights of salt, not just volume measurements.